LINENFOLD: The name provides a clue. An ornamental motif that looks like the vertical folds of linen. Typically, it describes a type of wood paneling. The motif, however, has decorated glass, silver and other objects. Use the term whenever a material (other than a textile) is rendered to represent fabric. Linenfold first appeared in Gothic architecture and furniture in northern Europe in the 15th and 16th centuries. The wood carving originated in Flanders, a principal location for the linen industry in the 15th century. 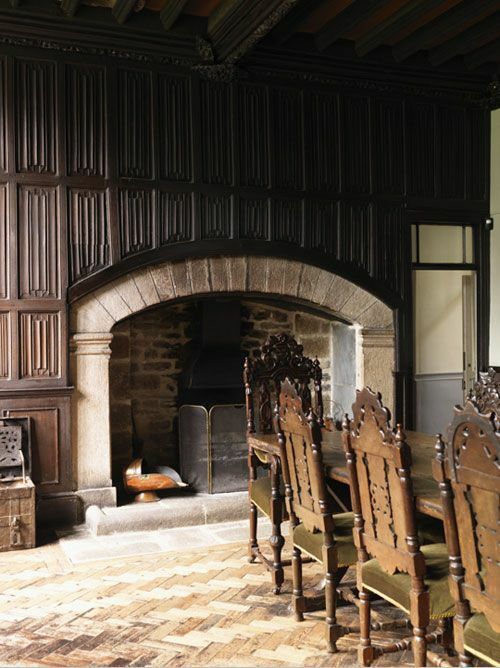 It’s use was particularly popular in England through the 17th century on walls and on Jacobean furniture. The motif is still used today. Linenfold also describes Tiffany lamps with glass shades that look like silk. Most people would call the painted “fabric” in this room ” tromp- l’oeil” (a future edition of Design Dictionary). Since I have a it a soft spot for tented rooms, I am going to stretch and include this image here. Technically, you could call the vertical fabric “linenfold”.